Regula, Mastra V35, 35mm camera. Photograph gallery. Well, I suppose the Mastra was never an expensive camera but I expected better. The exposures were generally okay, but the lens is significantly softer than I had hoped. 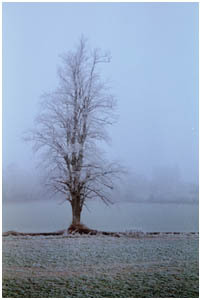 This image of a ice encrusted tree was taken on a chilly -4°C day in Hampshire UK, winter 2009. Visibility was very poor as there was freezing fog in the air, I might add I rode out on a motorbike. 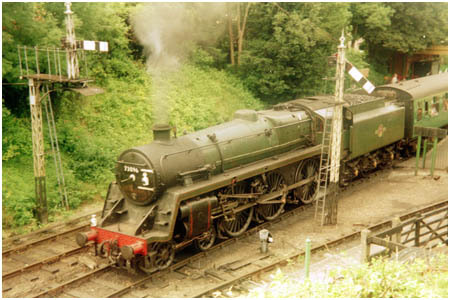 Left, in Sept 2008 is the market town of Ledbury, whilst below right is a locomotive pulling out out of New Alresford station on the preserved "Watercress Line" in Hampshire, UK. 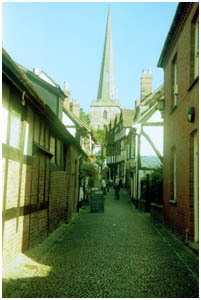 This is a favourite location owing to the availability of period photographic material. By the time the Mastra was made, steam locomotives only had two years left on British Railways, but I can still remember them.. just about! The lack of refinement can be appreciated in these images as the ladder rungs on the signal gantry aren't visible and the loco's number cannot be read. Our favourite photographic prop! 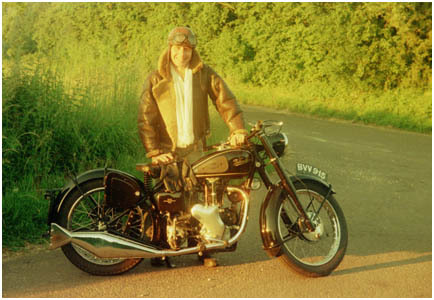 Though a photographic collection, this Velocette MAC is maintained in working order too. Built in 1951, it was the eighth to last iron headed model built. The design had barely altered since 1931, apart from the telescopic front forks, but after this they changed the engine to an aluminium head and boxy rocker cover. It was worn out by 1956 and left to rot in a shed. Rescued by a gentleman some 40 years later, it was restored but not run. Acquired by the LICM in March 2008, the last fettling was completed and she returned to the road on May 2008.